July is almost upon us and hundreds of tourists are making their way to Kenya’s Masai Mara Game reserves to witness the annual wildebeest migration. The migration of wildebeests from Tanzania to Kenya is a cycle that happens every year and is often referred to as the Great Migration. It is usually a good time for tourism in Kenya especially tour operators, hotels, and lodges in the Masai Mara Game Reserve area. 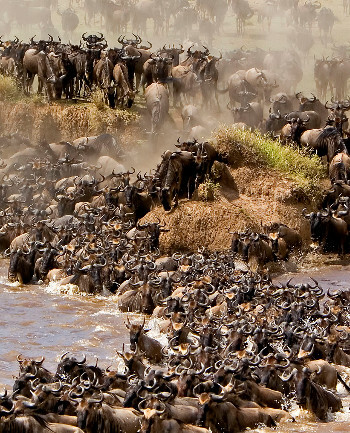 The wildebeest migration across the border starts in July and ends in September and is an exodus of over two million wildebeests and close to one million other animals. Having exhausted the Serengeti and Ngorongoro crater plains the animals instinctively begin their journey north in search of greener pastures. The synchronised march of these wildebeests across the Kenya Tanzania border and across the Grumeti and Mara rivers attracts tourists from all over the world and is one of the most amazing wildlife spectacles to behold on earth. According to James ole Sintiyo the chief game warden of the Masai Mara game reserve, like it happens every year tourists are already arriving in large numbers from the US, China, Europe, and some from the Arabian Peninsula to witness one of the world’s most amazing wonders. Booking for African safaris especially in the Masai Mara area are on a high during this month. Official statistics show that the bed capacity of the Masai Mara which is over 8000 beds is booked solid for the entire four months of the great migration. The Masai Mara was turned into a game reserve in 1948, and has more than a hundred hotels and lodges and camps. It also has interesting tourist facilities and features like hot air balloons and air trips, add the excitement of the great migration and it becomes a very attractive place to anyone looking to experience an Africa Safari. July is almost here and the migration has already started, and the tourists too have already started arriving to watch the show. The wildebeest population moves in an 800km anti-clockwise circle before returning to Tanzania some three months later to pastures replenished by the onset of the rainy season. Along the way, the dung left by the animals lays the foundation for next season’s pasture. The migration cycle is good for tourism in Tanzania as well. Masai Mara, located about 40km from the Mara River, is the only game reserve in Kenya that has an estimated 97 species of mammals, amphibians and reptiles as well as more than 400 birds species. It is held in trust by the Kenyan government for the Masai people, and is one of the country’s major tourist attractions. It not only offers tourists a chance to view the great migration first hand, but also a chance to catch sight of the “big five” –lions, buffaloes, elephants, leopards and rhinos. It is a true African Wilderness.